SÃO PAULO, BRAZIL – The signing of a new educational model for Brazilian high school public schools has received both strong criticism and praise. The new model signed by Brazilian President Michel Temer on Thursday calls for the doing away with most mandatory subjects, with the objective of making school more attractive to students. Students in classroom in São Paulo, photo by André Gomes de Melo/Agencia Brasil. According to the government’s proposed model all subjects except Portuguese and mathematics would become optional. Currently thirteen subjects including physical education, and arts are required to be taught in the three years of high school in Brazilian public schools. With the new rules physical education and arts, for example would only be required for elementary and junior high school students. According to the new model, English now becomes the required foreign language and should be made available in all high schools. Other languages, however, may also be offered as secondary foreign languages. The proposed new model also will work to progressively extended school hours to full days. For that the Ministry of Education plans to invest R$1.5 billion to offer full-time to over 500,000 youths by 2018. The objective of the government, say officials is to give youths a chance to choose what to study, according to their interests. This, say officials, will reduce the number of youths dropping out of high school before completing their education. 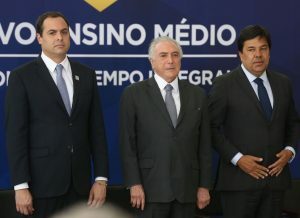 Brazil’s President, Michel Temer (center) and Education Minister Mendonça Filho (right) during ceremony to sign education reform on Thursday, photo by Valter Campanato/Agência Brasil. According to government officials, another ‘incentive’ to maintain today’s youths in school is to allow them to attend technical school instead of the traditional high school. These youths would receive certificates of conclusion and would be able to enter the job market with a skill right after high school. And although most education experts agree improvement in today’s educational system is needed, some are concerned about the way this is being done. “It is important to note that the state governments responsible for high school, spent years discussing and working with corporate foundations and no improvement was seen. The trend is that everything remain the same. This reform is ‘cosmetic’ because its objective is to change the route, not addressing structural issues such as infrastructure of schools, appreciation of education professionals, adequate number of students per class and a new way of teaching,” criticizes Daniel Cara, general coordinator of CNDE (National Campaign for the Right to Education. According to Cara important issues, such as education financing and teacher training policies are not included in the project. Currently, there are 8 million youths enrolled in high schools across Brazil, number that includes students from public and private schools. According to the Ministry of Education, while the dropout rate for primary school is 1.9 percent, the rate surges to 11.5 percent in high school.